I have a few dresses and other items left over from a very busy summer. If you have had your eye on something, now is the time! Please contact me with any questions you may have. These are all one-of-a kind hand-made items. 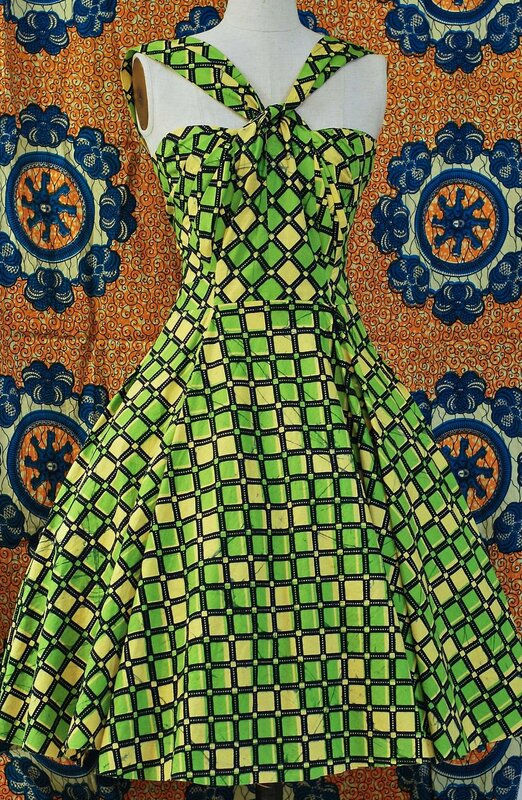 Bamboo Wax Print - sz 10 - waist 32" bust 38" was $425 - now $275. 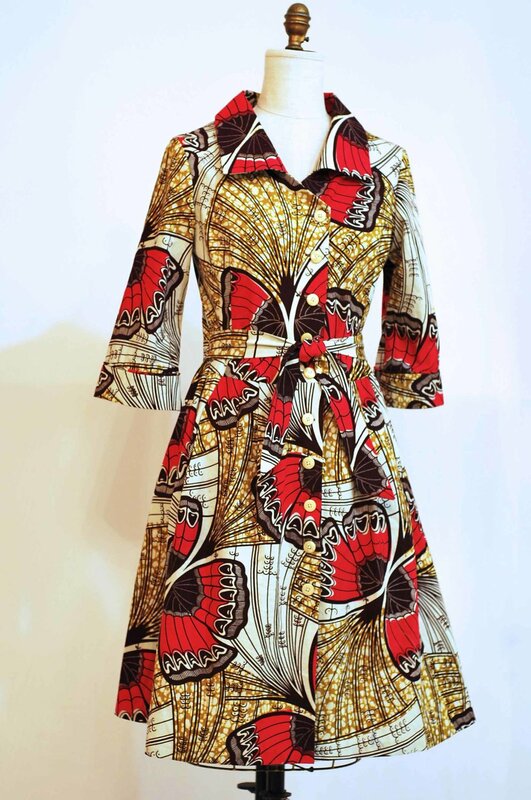 Butterfly Wrap Dress - sz 8 - 10 - waist up to 34" - Bust 37" was $475 - now $375. Blue / white Tunic - sz 6 - Bust 34 waist 28 - was $285. now $175. Long Yellow/Green Bow Dress - sz 6 - 35" Bust 28" waist - was $675. now $475. VIP Dress - sz 10 waist 34' bust 38" - was $475 now $300. Spinner Wrap Dress - sz 10 - waist adjustable up to 33" Bust 38" was $475. now $325. The wonderful Linda Dyett originally wrote this article for the online magazine NY City Women from which I have excerpted here. New York City’s couture-dressmakers, tailors and custom-fitters are on the rebound. Here’s a guide to 10 who make the cut. We consumers—especially midlife and older Americans—are paring down our wardrobes and shopping less and less these days—but we’re also spending more for higher-quality wearables that express our individuality and suit us to a T. And after a decade of online point-and-click purchases, a lot of us are also eager to return to hands-on service in brick-and-mortar surroundings. Enter custom-made—the artisanal antidote to fast fashion. Long the province of moneyed elites, celebrities, and mothers of the bride, custom dressmaking and tailoring are today also attracting regular women, who aren’t necessarily in the market for a dress to wear to a black-tie event. These new customers are ladies with style intuition, who know the cuts, fabrics, and colors they want when they see them. And with dozens of hours of pattern-making, cutting, sewing (sometimes by hand), and intricate multiple fittings, custom-made confers an optimal fit that disguises a bulging waist, out-of-shape hips, thighs, and arms, droopy breasts, posture slump, spinal curve, and other figure flaws. Of course couture dressmakers and tailors come at a price. While I’ve located one who’ll work up one of her off-the-rack $100 to $400 dresses in a different size for no extra fee, most charge $240 and up for custom-made blouses and shirts; $500 and up for made-to-measure (a widely used industry term referring to garments derived from a standard pattern); and $1,500 and up for made-to-order dresses and suits. These are hardly bargains, but they compare so favorably with higher-end, A-list designer ready-to-wear that plenty of women, once they’ve tried New York couture, won’t switch back. Here’s a rundown of some of the city’s most celebrated as well as off-the-beaten-track dressmakers and tailors who excel in couture and made-to-measure. Just keep in mind: what they offer isn’t seasonal fashion; it’s all about personal, individual style that you can hand down to your daughter or granddaughter, who’ll cherish it as much as you do. Appointments are essential almost everywhere, and finished garments take at least a month—sometimes several—to produce. Ensconced in a ground floor London Terrace studio, Elizabeth Cannon is that impossible-to-find accessible couturière whom stylish, independent-minded New York women dream about. Having honed her trade making costumes for the Paris Opera Ballet, her inspirations ranging from the Commedia dell’arte to Cocteau, she’s been designing made-to-order one-offs with a lyrical urban edge since 1980. Her clients? “Very decisive” artists, musicians, gallery owners, and entertainment executives, as well as members of the Trisha Brown Dance Company. “Nothing has ever fit me so perfectly,” says one delighted customer. “It’s as if Elizabeth were channeling Schiaparelli,” says another. Cannon does couture by the book, using custom-padded dressmaker forms, muslins (initial mock-ups in an inexpensive fabric), and sometimes interior boned corsets. She also offers a signature collection of off-the-rack casual day- and eveningwear ($500 and up, though prices can plummet to $100 at frequent sales) that can be altered to fit. 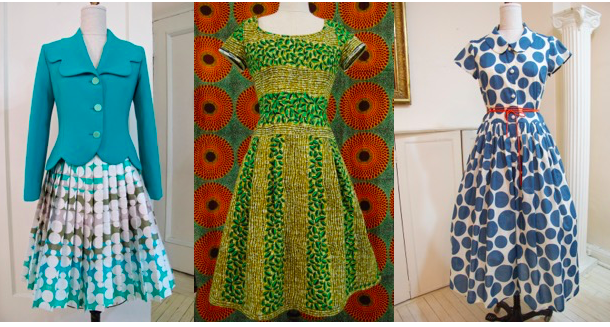 Outstanding items: A New Look-style silk shantung dress and jacket for a mother of the bride ($3,500); a silk-cotton blouse and heavy silk floral-print skirt with reinforced corseted yoke for a mother of the groom ($2,800); an African wax-print summer dress ($750); a belted, striped men’s shirting chemise, ($575, readymade; $750, made-to-order) that riffs on the frock Francoise Gilot wore in an iconic 1948 photo strolling along a French beach with an umbrella-wielding Pablo Picasso. Elizabeth Cannon Couture, 460 West 24th St., 212.929.8552. Some of these dresses appeared in a previous post, in various states of completion. I am playing between the seasons, trying out different styles and moods, preparing for an upcoming sale. Regal, playful, vibrant - I am sure that all the images on this fabric have meanings- there are coiled snakes, calla-lilies and birds, as well as an elaborate monogram. I was attracted to this fabric by it's complexity and let the patterns of the fabric guide my design process. This fabric has a beautiful hand. The dress is lined in rayon bemberg. It's a great holiday dress. Silver silk/wool blend. with pockets and tie belt. Lace necklace is separate from the dress. A soft petal-pink very easy top and very stretchy and easy skirt- this is a romantic look with a flattering silhouette.